Product code: ES7364 Categories: Sold Items, Sold Jewellery. Here is a very versatile and incredibly attractive antique opal and diamond pendant that converts to a brooch so easily allowing it to be worn in different ways with different attire. Beautifully hand made in 15ct gold and silver, antique pieces were made with silver on the top as white gold was not yet invented and the technology to heat and use platinum in jewellery wouldn’t be discovered for another 20 years after this piece was made. Set with a vibrant solid Australian opal in the centre taking pride of place, it is without a doubt that Australia’s opals are regarded as the best in the world. Not only do they often display wonderful spectral colours as can be seen here in this opal, but they are also so much more stable than the Ethiopian opals that are now on the market which have a tendency to craze and crack after a few short years. 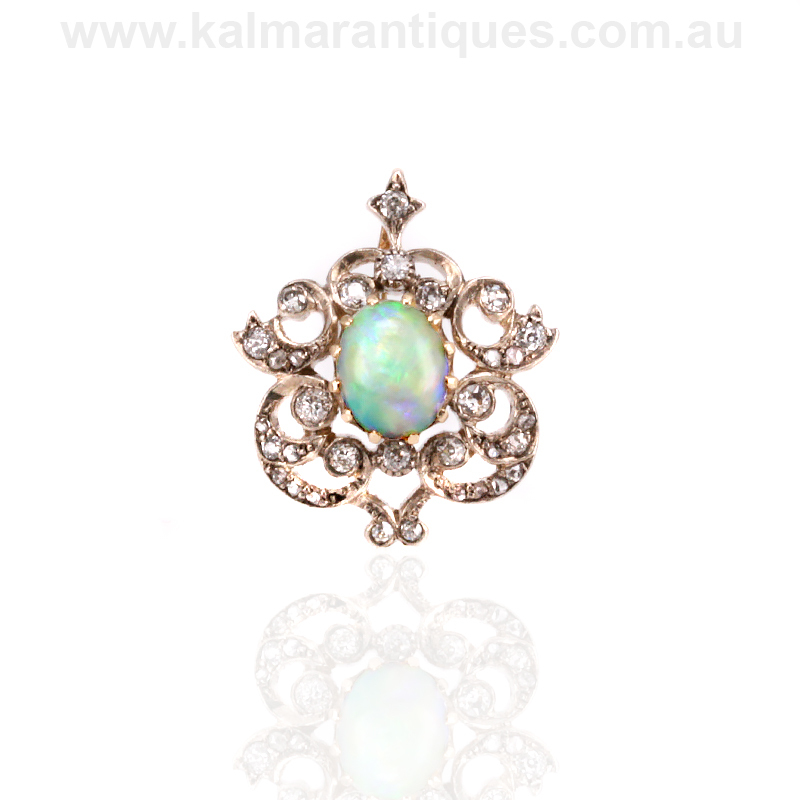 The opal stands out so well against not only the diamonds which sparkle magnificently, but also the setting which is so typical of the Victorian era when this was made. With an ingenious system to easily allow the brooch fitting to be removed when one is to wear it as a pendant, this simple technique of allowing the brooch fitting to be removed allows it to sit perfectly against the skin. Set with sixteen European cut diamonds that total 0.36 carats and fourteen rose cut diamonds which total 0.10 carats, the piece itself measures 25.5mm across by 21.5mm. No matter how this antique opal and diamond piece is being worn, there is little doubt that it will continue to always be admired and appreciated for both its beauty and ingenious design to seamlessly convert to a brooch and back again to a pendant. Tag: Antique opal and diamond pendant. Antique opal and diamond pendant that converts to a brooch. This lovely pendant can so easily convert to a brooch thanks to the ingenious design often seen in Victorian jewellery of a removable pin at the back.